"Fort Wayne" redirects here. For other uses, see Fort Wayne (disambiguation). Clockwise from top: Downtown Fort Wayne skyline, Chief Jean-Baptiste de Richardville House, John Chapman's grave in Johnny Appleseed Park, Dr. Martin Luther King Jr. Memorial Bridge, Embassy Theatre, and Historic Fort Wayne. "Summit City"; "City of Churches"; "City That Saved Itself"; "Magnet Wire Capital of the World"
Location of Fort Wayne in Allen County, Indiana. 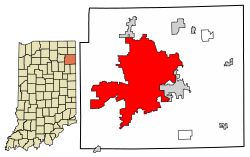 Fort Wayne is a city in the U.S. state of Indiana and the seat of Allen County, United States. Located in northeastern Indiana, the city is 18 miles (29 km) west of the Ohio border and 50 miles (80 km) south of the Michigan border. With a population of 253,691 in the 2010 census, it is the second-most populous city in Indiana after Indianapolis, and the 75th-most populous city in the United States. It is the principal city of the Fort Wayne metropolitan area, consisting of Allen, Wells, and Whitley counties, a combined population of 419,453 as of 2011. Fort Wayne is the cultural and economic center of northeastern Indiana. The city is within a 300-mile (482.803 km) radius of major population centers, including Chicago, Cincinnati, Cleveland, Columbus, Detroit, Indianapolis, Louisville, Lexington, and Milwaukee. In addition to the three core counties, the combined statistical area (CSA) includes Adams, DeKalb, Huntington, Noble, and Steuben counties, with an estimated population of 615,077. 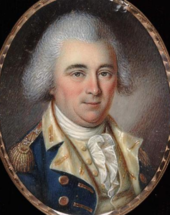 Fort Wayne was built in 1794 by the United States Army under the direction of American Revolutionary War general Anthony Wayne, the last in a series of forts built near the Miami village of Kekionga. Named in Wayne's honor, the European-American settlement developed at the confluence of the St. Joseph, St. Marys, and Maumee rivers as a trading post for pioneers. The village was platted in 1823 and underwent tremendous growth after completion of the Wabash and Erie Canal and advent of the railroad. Once a booming manufacturing town located in what became known as the Rust Belt, Fort Wayne's economy in the 21st century is based upon distribution, transportation and logistics, healthcare, professional and business services, leisure and hospitality, and financial services. The city is a center for the defense industry which employs thousands. There are also many jobs through local healthcare providers Parkview Health and Lutheran Health Network. Fort Wayne was an All-America City Award recipient in 1982, 1998, and 2009. The city also received an Outstanding Achievement City Livability Award by the U.S. Conference of Mayors in 1999. 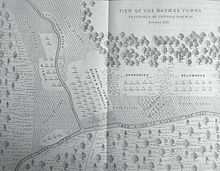 An illustrated map of Kekionga (1790). In 1696, Comte de Frontenac appointed Jean Baptiste Bissot, Sieur de Vincennes as commander of the outpost. The French built Fort Miami in 1697 as part of a group of forts and trading posts built between Quebec and St. Louis. In 1721, a few years after Bissot's death, Fort Miami was replaced by Fort St. Philippe des Miamis. The first census in 1744 recorded a population of approximately 40 Frenchmen and 1,000 Miami. Increasing tension between France and Great Britain developed over control of the territory. In 1760, France ceded the area to Britain after its forces in North America surrendered during the Seven Years' War, known on the North American front as the French and Indian War. In 1763, various Native American nations rebelled against British rule and retook the fort as part of Pontiac's Rebellion. The Miami regained control of Kekionga, ruling it for more than 30 years. An illustration depicting the 1812 military garrison. The first settlement started in 1815. In 1819, the military garrison abandoned the fort and moved to Detroit. In 1822, a federal land office opened to sell land ceded by local Native Americans by the Treaty of St. Mary's in 1818. Platted in 1823 at the Ewing Tavern, the village became an important frontier outpost, and was incorporated as the Town of Fort Wayne in 1829, with a population of 300. The Wabash and Erie Canal's opening improved travel conditions to the Great Lakes and Mississippi River, exposing Fort Wayne to expanded economic opportunities. 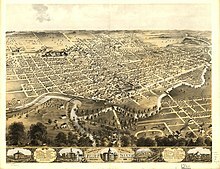 The population topped 2,000 when the town was incorporated as the City of Fort Wayne on February 22, 1840. Pioneer newspaperman George W. Wood was elected the city's first mayor. Fort Wayne's "Summit City" nickname dates from this period, referring to the city's position at the highest elevation along the canal's route. As influential as the canal was to the city's earliest development, it quickly became obsolete after briefly competing with the city's first railroad, the Pittsburgh, Fort Wayne and Chicago Railway, completed in 1854. A lithograph of Fort Wayne (1868). At the turn of the 20th century, the city's population reached nearly 50,000, attributed to a large influx of German and Irish immigrants. Fort Wayne's "urban working class" thrived in industrial and railroad-related jobs. The city's economy was substantially based on manufacturing, ushering in an era of innovation with several notable inventions and developments coming out of the city over the years, such as gasoline pumps (1885), the refrigerator (1913), and in 1972, the first home video game console. A 1913 flood caused seven deaths, left 15,000 homeless, and damaged over 5,500 buildings in the worst natural disaster in the city's history. As the automobile's prevalence grew, Fort Wayne became a fixture on the Lincoln Highway. Aviation arrived in 1919 with the opening of the city's first airport, Smith Field. The airport served as Fort Wayne's primary commercial airfield until Baer Field (now Fort Wayne International Airport) was transferred to the city in 1947 after serving as a military base during World War II. 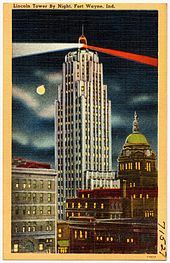 The Lincoln Bank Tower was completed as Indiana's tallest building in 1930. Fort Wayne was hit by the Great Depression beginning in 1929, with most factories cutting their workforce. The stock market crash did not discourage plans to build the city's first skyscraper and Indiana's tallest building at the time, the Lincoln Bank Tower. By 1935, the New Deal's WPA put over 7,000 residents back to work through local infrastructure improvements, including the construction of new parks, bridges, viaducts, and a $5.2 million sewage treatment facility. The post-World War II economic boom helped the city prosper once again. Between 1950 and 1955, more than 5,000 homes were built, many in large subdivisions in rural Allen County. In 1950, Fort Wayne's first bypass, Coliseum Boulevard, opened on the north side of the city, followed by the city's first arena, War Memorial Coliseum, bringing new opportunities for suburban expansion. The Coliseum was home to the NBA's Fort Wayne Pistons from 1952 to 1957. The opening of enclosed shopping malls and the construction of Interstate 69 through rural areas north and west of the city proper further drove the exodus of retail from downtown through the 1960s. According to the Fort Wayne Home Builders Association estimates, more than 80 percent of new home construction occurred outside the city proper in the 1970s. A flooded Superior Street in 1982. Like many cities in the Rust Belt, deindustrialization in the 1980s brought urban blight, increased crime, and a decrease in blue-collar manufacturing jobs. Downtown and surrounding neighborhoods continued declining as residents and businesses sprawled further into rural Allen County. A 1982 flood forced an evacuation of 9,000 residents, damaging 2,000 buildings, and costing $56.1 million (1982 USD, $137 million 2015 USD). The 1990s marked a turnaround for the city, as local leaders focused on crime reduction, economic diversification, and downtown redevelopment. By 1999, Fort Wayne's crime rate decreased to levels not seen since 1974, and the city's economy recovered, with the unemployment rate hovering at 2.4 percent in 1998. Clearing blighted buildings downtown resulted in new public greenspaces, including Headwaters Park, which has become the premier community gathering space and centerpiece in the city's $50 million flood control project. Fort Wayne celebrated its bicentennial in 1994. The city continued to concentrate on downtown redevelopment and investment in the 2000s. The decade saw the beginnings of its transformation, with renovations and expansions of the Allen County Public Library, Grand Wayne Convention Center, and Fort Wayne Museum of Art. In 2007, the $130 million Harrison Square development was launched, creating Parkview Field. Suburban growth continued, with the opening of Fort Wayne's first lifestyle center, Jefferson Pointe, and the half-billion dollar Parkview Regional Medical Center in 2012. Fort Wayne is in the East North Central region of the Midwestern United States, in northeastern Indiana, 18 miles (29 km) west of Ohio and 50 miles (80 km) south of Michigan. According to the 2010 census, Fort Wayne has a total area of 110.834 square miles (287.06 km2), of which 110.62 square miles (286.50 km2) (or 99.81%) is land and 0.214 square miles (0.55 km2) (or 0.19%) is water. The St. Marys River (left) and St. Joseph River (right) converge to form the Maumee River (foreground). For a regional summit, the city is situated on flat land characterized by little topographical relief, a result of the Wisconsin glaciation episode. Receding glaciers eroded the land, depositing an evenly distributed layer of sediment during the last glacial period. The most distinguishable topographical feature is Cedar Creek Canyon, just north of the city proper near Huntertown. The Fort Wayne Moraine follows two of the city's three rivers: the St. Marys and St. Joseph. The two rivers converge to form the Maumee, which eventually empties into Lake Erie. Land east of the moraine includes the former Great Black Swamp, a lacustrine plain formed by Glacial Lake Maumee. The Little River flows southwest of Fort Wayne, a tributary of the Wabash River, and remnant of the Maumee Torrent. The city lies along the St. Lawrence Continental Divide which separates the Great Lakes Basin from the Gulf of Mexico watershed. The most important geographical feature of the area is the short distance overland between the Three Rivers system, which eventually flows to the Atlantic, and the Wabash system, which eventually flows to the Gulf of Mexico. This came to be the "portage" or carrying place, over which travelers could transport their cargoes from one system to the next. This natural crossroads attracted the Native Americans for thousands of years. It later attracted the European explorers and traders and the American pioneer settlers who continued to develop the area as a transportation and communications center. 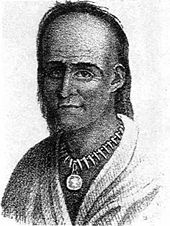 Chief Little Turtle of the Miami Nation expressed its importance eloquently at the treaty of Greenville in 1795 when he called it "that glorious gate...through which all the words of our chiefs had to pass through from north to south and from east to west." Fort Wayne's urban tree canopy is 29 percent, double the state average of 14.5 percent and above the national average of 27.1 percent. The canopy is decreasing, notably from development and the emerald ash borer infestation. Fort Wayne has been designated a Tree City USA since 1990. Downtown Fort Wayne, looking south from the St. Marys River. 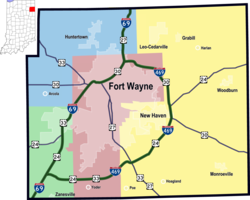 Historically, Fort Wayne has been divided into four unofficial quadrants: northeast, northwest, southeast, and southwest. Calhoun Street divides the southwest and southeast, while the St. Joseph River divides the northwest and northeast quadrants. The Maumee River separates the northeast and southeast, while portions of the St. Marys River and Chicago, Fort Wayne and Eastern Railroad separate the northwest and southwest quadrants. Fort Wayne's early-20th century development was influenced by the City Beautiful movement and centered on a "park and boulevard plan" conceived by urban planner Charles Mulford Robinson in 1909 and finalized by landscape architect George Kessler in 1912. The master plan proposed a network of parkways and boulevards connecting the city's three rivers and Spy Run Creek to dozens of neighborhoods and parks. Several parks were designed by noted landscape architect Arthur Asahel Shurcliff. Much of the original plan was implemented by 1955. In 2010, the Fort Wayne Park and Boulevard System was listed on the National Register of Historic Places, consisting of 11 public parks, four parkways, and ten boulevards, covering 1,883 acres (762 ha). The Allen County Courthouse was completed in 1902 and was designated a National Historic Landmark in 2003. During the 19th century, Fort Wayne was dominated by Greek Revival, Gothic Revival, and Italianate architecture. Examples of Greek Revival architecture remain in the city, with one being the Richardville House (1827), a National Historic Landmark. Gothic and Gothic Revival architecture can be found in some of the city's most prominent churches, including Trinity English Lutheran Church (1846), Cathedral of the Immaculate Conception (1860), Trinity Episcopal Church (1865), and Saint Paul's Evangelical Lutheran Church (1889). Popular early-20th century architectural styles found in the city include Queen Anne, Richardsonian Romanesque, Neoclassical, Colonial Revival, Dutch Colonial Revival, Tudor Revival, Prairie, American Craftsman, American Foursquare, and Art Deco. Richardsonian Romanesque buildings include Fort Wayne City Hall (1893) and John H. Bass Mansion (1902), each designed by Wing & Mahurin. Notable examples of Neoclassical architecture include the Masonic Temple (1926) and North Side High School (1927). Beaux-Arts, an architectural style closely related to Neoclassical, gained popularity during the City Beautiful movement of the 1890s and early 1900s, which is reflected in the Allen County Courthouse (1902). The Allen County Courthouse is one of two National Historic Landmarks in the city. The Pennsylvania Railroad Station, also known as Baker Street Station (1914), was designed in American Craftsman style. At 312 feet (95 m), the Art Deco-style Lincoln Bank Tower was Fort Wayne's first high-rise and Indiana's tallest building from 1930 to 1962. The E. Ross Adair Federal Building and United States Courthouse (1932) is another example of Art Deco architecture. Williams–Woodland Park Historic District includes examples of Queen Anne and Colonial Revival residential homes, while the Forest Park Boulevard Historic District includes Tudor Revival homes. Modern and Postmodern architecture can be found in buildings constructed during the second half of the 20th century in Fort Wayne. The John D. Haynes House (1952) was designed by Frank Lloyd Wright, while the campus of Concordia Theological Seminary (1953) was designed by Eero Saarinen. Postmodern architect Michael Graves' first commissions were built in the city, including Hanselmann House (1967) and Snyderman House (1972, now demolished). Louis Kahn's design for the Arts United Center (1973) was inspired by a violin and its case. Other notable buildings include Indiana Michigan Power Center (1982), the tallest building in the city and tallest building in Indiana outside of Indianapolis, at 442 feet (135 m). The Oakdale neighborhood after a January snow. Fort Wayne lies in the humid continental climate zone (Köppen: Dfa), experiencing four distinct seasons. The city is located in USDA hardiness zones 5b and 6a. Typically, summers are hot, humid, and wet. Winters are generally cold with moderate snowfall. The average annual precipitation is 37.34 in (948 mm), recorded at Fort Wayne International Airport. During the winter season, snowfall accumulation averages 33.5 in (85 cm) per year. Lake-effect snow is not uncommon to the region, but usually appears in the form of light snow flurries. The National Weather Service reports the highest recorded temperature in the city at 106 °F (41 °C), most recently on June 28, 2012, and the lowest recorded temperature at −24 °F (−31 °C) on January 12, 1918. The wettest month on record was June 2015, with 11.98 in (304 mm) of precipitation. The greatest 24-hour rainfall was 4.93 in (125 mm) on August 1, 1926. The snowiest month on record was January 2014, with 30.3 in (77 cm) of snowfall. The greatest calendar-day snowfall was 18.0 in (46 cm) on February 28, 1900. Severe weather is not uncommon, particularly in the spring and summer months; the city experiences an average of 39 thunderstorm days and about 10 severe weather days annually. An EF2 tornado struck northern Fort Wayne on May 26, 2001, injuring three and causing damage along the Coliseum Boulevard corridor and a subdivision. Fort Wayne experienced 91 mph (146 km/h) wind gusts in the June 2012 North American derecho, knocking out power to 78,000, uprooting approximately 500 trees, and costing $2.5 million. According to the 2010 Census, there were 253,691 people and 113,541 households. The racial makeup of the city is 73.62% White, 15.41% Black or African American, 0.37% Native American or Alaska Native, 3.3% Asian (1.4% Burmese, 0.4% Indian, 0.3% Vietnamese, 0.2% Chinese, 0.2% Filipino, 0.1% Korean, 0.1% Laotian, 0.1% Thai), 0.06% Pacific Islander, 3.72% from other races, and 3.52% from two or more races. 7.96% of the population are Hispanic or Latino of any race. Among the Hispanic population, 6.1% are Mexican, 0.4% Puerto Rican, and 0.3% Guatemalan. Non-Hispanic Whites were 70.3% of the population in 2010, down from 87.7% in 1970. There were 101,585 households of which 30.1% had children under the age of 18 living with them, 42.3% were married couples living together, 14.8% had a female householder with no husband present, 4.9% had a male householder with no wife present, and 38.0% were non-families. 31.2% of all households were made up of individuals and 9.7% had someone living alone who was 65 years of age or older. The average household size was 2.44 and the average family size was 3.09. The median age in the city was 34.5 years. 26.4% of residents were under the age of 18; 10.2% were between the ages of 18 and 24; 26.5% were from 25 to 44; 24.9% were from 45 to 64; and 12% were 65 years of age or older. The gender makeup of the city was 48.4% male and 51.6% female. Fort Wayne has the largest Burmese American population in the U.S., estimated at 6,000. Burmese refugee settlement and "secondary migrants" doubled the city's Asian population between 2000 and 2010. Interior of the Cathedral of the Immaculate Conception, co-cathedral of the Roman Catholic Diocese of Fort Wayne-South Bend. Fort Wayne is sometimes referred to as the "City of Churches," an unofficial moniker dating to the late-19th century when the city was the regional hub of Catholic, Lutheran, and Episcopal faiths. Today, there are 360 churches in the city. 54 percent of Fort Wayne residents identify as religious, where 16 percent are Catholic, 9 percent are Lutheran, 6.5 percent are Baptist, 5 percent are Methodist, and 0.14 percent are Jewish, with 16.5 percent adhering to other Christian faiths. An increasing religious minority is found among the city's immigrant communities, including Buddhism, Hinduism, and Islam. Major churches include the Cathedral of the Immaculate Conception, Saint Paul's Evangelical Lutheran Church and Trinity Episcopal Church. Fort Wayne's Reform Judaism population is served by Congregation Achduth Vesholom, the oldest Jewish congregation in Indiana, founded in 1848. In 2013, construction began on the first Burmese Muslim mosque to be built worldwide since the mid-1970s. As of December 2012, four national Christian denominations were headquartered in the city: the American Association of Lutheran Churches, the Fundamental Baptist Fellowship Association, the Missionary Church and the Fellowship of Evangelical Churches. Fort Wayne is the seat of the Roman Catholic Diocese of Fort Wayne–South Bend, covering 14 counties in Northern Indiana, and the Lutheran Church–Missouri Synod Indiana District, encompassing all of Indiana and north central Kentucky. The vacant General Electric complex consists of 30 acres (12 ha) and 12 buildings. In 2017, the Fort Wayne metropolitan area had a gross domestic product (GDP) of $25.7 billion. The top four industries were: manufacturing ($8.1B), health care ($2.54B), retail trade ($1.4B), and finance and insurance ($1.3B) Government, if it had been a private industry, would have tied for third, generating $1.4 billion. Manufacturing is deeply rooted in Fort Wayne's economic history, dating to the earliest days of the city's growth as an important trade stop along the Wabash and Erie Canal. Railroads, introduced shortly after the canal's arrival, eased travel from Fort Wayne to other booming industrial centers along the Great Lakes, such as Chicago, Detroit, Toledo, and Cleveland. Throughout the early and mid-20th century, manufacturing dominated the city's economic landscape. From 1900 to 1930, Fort Wayne's industrial output expanded by 747 percent, with total production valued at $95 million in 1929, up from $11 million in 1899. The total workforce also increased from 18,000 in 1900 to nearly 50,000 in 1930. Companies that had a significant presence in the city include Dana Holding Corporation, Falstaff Brewing Corporation, Fruehauf Corporation, General Electric, International Harvester, Magnavox, Old Crown Brewing Corporation, and Tokheim, among several others, producing goods such as refrigerators, washing machines, automatic phonographs, meat packing products, televisions, garbage disposals, automotive parts and motors, trailers, gasoline pumps, trucks, beer, tents and awnings. Magnet wire production became an especially vital component to the city's economy. In 1960, Fort Wayne was at the center of the United States magnet wire industry, home to New Haven Wire and Cable Company, Phelps Dodge, Rea Magnet Wire, Superior Essex, and an operation at General Electric, producing nearly 90 percent of North America's magnet wire. Abraham Lincoln: The Hoosier Youth stands in front of Lincoln Financial Group's downtown offices. The 1970s and 1980s were times of economic depression in Fort Wayne, when much of the city's manufacturing foundation eroded and the blue-collar workforce shrank. Fort Wayne joined several other cities reeling economically within the Rust Belt. At the same time, General Electric also downsized much of its more than 10,000-person workforce. Amid other area plant closures and downsizing, coupled with the early 1980s recession, the city lost 30,000 jobs and reached a 12.1 percent unemployment rate. The arrival of General Motors in 1987 helped fill the void from shuttered manufacturers and aided in the area's recovery, employing 3,000 at its Fort Wayne Assembly. In 2017, General Motors was the largest manufacturer in the city, employing 4,100 assembling Chevrolet Silverado regular and double cab light- and heavy-duty pickup trucks. Through the 1990s and into the 2000s, the city diversified its economy; manufacturing now employs 16.9 percent of Allen County's workforce. Other sectors include distribution, transportation, and logistics (23.1 percent), health care (17.9 percent), professional and business services (12.1 percent), leisure and hospitality (11.1 percent), and financial services (6.3 percent). The leisure and hospitality sector has especially grown, with 5.8 million visitors spending $545 million in 2013, a 4.3 percent increase over the previous year. The city is a center for the defense industry, employing thousands at such companies as BAE Systems (1,150), Harris Corporation (888), Raytheon Systems (950), and the Fort Wayne Air National Guard Station (423). Despite economic diversification, the city was significantly impacted by the Great Recession. According to a report from Pew Research Center, the city lost nearly a quarter of its manufacturing jobs and 11% of its economic status between 2000 and 2014. Economic Innovation Group's 2016 Distressed Communities Index Report ranked Fort Wayne among the most unequal large cities in the U.S. in terms of linking economic opportunities to its distressed zip codes. As of 2017[update], Allen County's labor force was 180,637 with an unemployment rate of 2.5 percent. Companies based in Fort Wayne include Brotherhood Mutual, Do it Best, Franklin Electric, Frontier Communications – Central Region, Genteq, Indiana Michigan Power, K&K Insurance, MedPro Group, North American Van Lines, Rea Magnet Wire, Steel Dynamics, Sweetwater Sound, and Vera Bradley. Steel Dynamics is the only Fortune 500 company headquartered in the city, ranking 354th. Founded in 1905, Lincoln Financial Group was based in Fort Wayne until its move to suburban Philadelphia in 1999. The company maintains a large presence in the city, employing nearly 2,000. The Embassy Theatre opened in 1928 as a movie palace. The Embassy Theatre is a 2,471-seat performing arts theater which hosts over 200,000 patrons annually. Since its founding in 1944, the Fort Wayne Philharmonic Orchestra has often been hosted at the Embassy. The University of Saint Francis Robert Goldstine Performing Arts Center, located on its Downtown Campus, contains a 2,086-seat auditorium. Since its establishment in 2010, the Cultural District has been home to several of the city's cultural institutions, including the Fort Wayne Museum of Art, Auer Center for Arts and Culture, Arts United Center, and Hall Community Arts Center. Arts United Center houses the Fort Wayne Civic Theater, Fort Wayne Dance Collective, and Fort Wayne Youtheatre. Auer Center for Arts and Culture houses Fort Wayne Ballet. Hall Community Arts Center houses Cinema Center, an independent film venue. Though used mainly for exhibitions and conventions, the Grand Wayne Convention Center hosts dance and choir productions, such as the annual Foundation for Art and Music in Education (FAME) Northeast Festival. Foellinger Theatre, a 2,500-seat amphitheater in Franke Park, hosts seasonal acts and outdoor concerts during warmer months. Located west of downtown, Arena Dinner Theatre is a nonprofit community arts corporation with a focus on live theater production, annually hosting seven full-length theatrical productions. A reticulated giraffe in the Fort Wayne Children's Zoo's African Journey exhibit. The Fort Wayne Children's Zoo has been lauded as one of the nation's foremost zoos. Covering 40 acres (16 ha) and containing 1,000 animals of 200 different species, the zoo is the largest regional attraction, regularly drawing over 500,000 visitors annually. The Foellinger-Freimann Botanical Conservatory gardens cover 24,500-square-foot (2,280 m2), displaying over 1,200 plants of 502 different species and 72 types of cacti. Science Central, an interactive science center, contains permanent displays and temporary exhibits, drawing 130,000 visitors annually. Established in 1921, the Fort Wayne Museum of Art (FWMoA) is accredited by the American Alliance of Museums, specializing in the collection and exhibition of American art. The FWMoA annually receives 100,000 visitors. The History Center, located in Fort Wayne's Old City Hall, manages a collection of more than 23,000 artifacts recalling the region's history. The center is overseen by the Allen County–Fort Wayne Historical Society, which maintains the Richardville House, one of two National Historic Landmarks in the city. Historic Fort Wayne, a replica of the 1815 fortification, hosts scheduled tours and historical reenactments throughout the year. Other cultural museums include the African/African–American Historical Museum, Fort Wayne Firefighters Museum, Greater Fort Wayne Aviation Museum, and Baer Field Heritage Air Park. The Allen County Public Library's Fred J. Reynolds Historical Genealogy Department is the second-largest genealogy collection in North America. The collection contains 350,000 printed volumes and 513,000 items of microfilm and microfiche. A concert during the 42nd Three Rivers Festival in 2010. The city hosts a variety of cultural festivals and events annually. Festivals commemorating ethnic food, dance, music, and art include Germanfest, Greek Festival, and Japanese Cherry Blossom Festival. Initiated in 1997, Fort Wayne Pride celebrates northeast Indiana's LGBTQ community. BBQ RibFest showcases barbecue rib cooks and live entertainment, attracting 40,000 visitors annually. Fort4Fitness is a certified half marathon, 4-mile (6.4 km) run/walk, and health fair. Over 9,000 participated in the 2011 half marathon. In 2012, Fort4Fitness debuted a spring cycle, Bike-the-Fort, which included three bicycling tours with over 1,000 participants. HolidayFest begins with the Night of Lights on Thanksgiving eve, with the lighting of the PNC Santa and Reindeer, Wells Fargo Holiday Display, and Indiana Michigan Power Christmas Wreath, ending with a fireworks finale at Parkview Field. The largest annual events in the city are the Johnny Appleseed Festival and the Three Rivers Festival. The Johnny Appleseed Festival draws 300,000 visitors. The festival is held at Johnny Appleseed Park, where American folklore legend John Chapman is believed to be buried. Apple-themed cuisine, crafts, and historical demonstrations recalling 19th century American pioneering are among some of the festival's events. Three Rivers Festival, a celebration of Fort Wayne, spans nine days each July, attracting 400,000 visitors. Three Rivers features over 200 events, including a parade, midway, hot dog eating contest, bed race, raft race, arts fair, and fireworks spectacular. Other annual events include the Allen County Fair, BAALS Music Festival, National Soccer Festival, and the Vera Bradley Outlet Sale. Allen County War Memorial Coliseum (top) and Parkview Field (bottom). Fort Wayne is home to three minor league sports franchises: the ECHL's Fort Wayne Komets, the Midwest League's Fort Wayne TinCaps, and the NBA G League's Fort Wayne Mad Ants who are owned and operated by their parent club, the Indiana Pacers. Fort Wayne also hosts the Fort Wayne Derby Girls of the Women's Flat Track Derby Association Division 2. These teams compete at the Allen County War Memorial Coliseum. Parkview Field is home to the TinCaps. Intercollegiate sports in the city include the Purdue Fort Wayne Mastodons, representing Purdue University Fort Wayne (PFW) in the NCAA's Division I Summit League, and NAIA schools Indiana Tech (Wolverine–Hoosier Athletic Conference) and University of Saint Francis (Crossroads League and Mid-States Football Association). The Mastodons had represented Indiana University – Purdue University Fort Wayne (IPFW) prior to its 2018 split into two separate institutions (see below), and from 2016 to 2018 were branded as the Fort Wayne Mastodons, but the athletic brand was changed to "Purdue Fort Wayne" shortly before the split took effect. The city has been home to other professional sports franchises, including the National Basketball Association's Fort Wayne Pistons (which moved to Detroit in 1957), the Fort Wayne Daisies of the All-American Girls Professional Baseball League, and the Fort Wayne Kekiongas of the National Association of Professional Base Ball Players (precursor to Major League Baseball). Some notable events in sports history occurred in Fort Wayne. On June 2, 1883, Fort Wayne hosted the Quincy Professionals for one of the first lighted evening baseball games ever recorded. 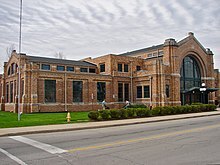 Fort Wayne is also credited as the birthplace of the NBA, as Pistons' coach Carl Bennett brokered the merger of the BAA and the NBL in 1948 from his Alexander Street home. On March 10, 1961, Wilt Chamberlain became the first player in the NBA to reach 3,000 points in a single season while competing at the War Memorial Coliseum. 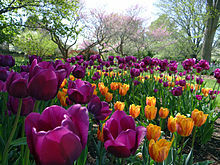 Tulips bloom in Foster Park. Fort Wayne Parks and Recreation maintains 86 public parks totaling 2,805 acres (1,135 ha). Three public and 20 private golf courses are located in Allen County. Franke Park is the most extensive city park, covering 339.24 acres (137.3 ha). Franke is home to the Foellinger Theatre, Shoaff Lake, and the Fort Wayne Children's Zoo. Other notable parks include Johnny Appleseed Park (home to a campground and John Chapman's grave) and McCulloch Park (home to Samuel Bigger's grave). Foellinger-Freimann Botanical Conservatory, Headwaters Park, Lawton Skatepark, and Historic Fort Wayne are located downtown. Hurshtown Reservoir, near Grabill, is the largest body of water in Allen County and is popular with watersports enthusiasts for sailing and fishing. Some 300 lakes are located within 50 miles (80 km) of the city. Located downtown along the St. Marys River, Fort Wayne Outfitters offers canoe, kayak, stand-up paddle board, and pontoon boat rentals for recreation along the three rivers. Canoeing on the St. Marys River. Starting in the 1970s, the city developed a system of recreational trails along the riverbanks, known as the Rivergreenway, with the aim of beautifying the riverfronts and promoting active lifestyles for residents. The Rivergreenway was designated a National Recreation Trail in 2009. As of 2018, the Rivergreenway had expanded with additional trails to encompass nearly 180 miles (290 km) throughout the city and county, with about 550,000 annual users. With the expansion of trails in recent years, cycling has become an emerging mode of transportation for residents. In 2009, the city's first bicycle lanes were established with the installation of 250 bike parking places. In 2016, Fort Wayne was designated a Bronze Level bicycle friendly community by the League of American Bicyclists. According to the Trust for Public Land's 2017 ParkScore Index, some 56% of Fort Wayne residents are underserved. 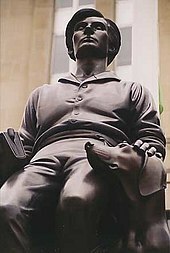 A statue of General "Mad" Anthony Wayne, namesake of the city, stands in Freimann Square. The Allen County Courthouse (center) and the Rousseau Centre (right), home to city and county offices. Fort Wayne has a mayor–council government. The mayor, city clerk, and city council members serve four-year terms. Fort Wayne's mayor is Tom Henry, a Democrat, who was elected in 2007. Henry succeeded Democrat Graham Richard who chose not to run for re-election after two terms as mayor. Henry was re-elected to a third term in 2015. Karl Bandemer was appointed deputy mayor in 2013. Lana Keesling was elected city clerk in 2015. Fort Wayne City Council has nine elected members, one representative from each of the city's six council districts and three at-large members, serving four-year terms. The city is represented in the Indiana General Assembly by three Senate Districts and seven House Districts. Fort Wayne's state senators include Dennis Kruse (14th District), Liz Brown (15th), and David Long (16th). Representatives include Dan Leonard (50th District), Ben Smaltz (52nd), Phil GiaQuinta (80th), Martin Carbaugh (81st), Christopher Judy (83rd), Bob Morris (84th), and Dave Heine (85th). Federally, Fort Wayne is part of Indiana's 3rd congressional district, represented by Republican Jim Banks, a position he has held since 2016. 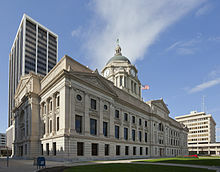 Under the Unigov provision of Indiana Law, Fort Wayne would have automatically consolidated with Allen County when its population exceeded 250,000, previously the minimum population for a first class city in Indiana. Fort Wayne nearly met the state requirements for first class city designation on January 1, 2006 when 12.8 square miles (33 km2) of neighboring Aboite Township (and a small section of Wayne Township) including 25,094 people were annexed. However, a 2004 legislative change raised the population threshold for first-class status from 250,000 to 600,000, which ensured Indianapolis' status as the only first class city in Indiana. Fort Wayne's E. Ross Adair Federal Building and U.S. Courthouse houses the United States District Court for the Northern District of Indiana, which was authorized by Congress in 1928. Municipal and state laws are enforced by the Fort Wayne Police Department, an organization of 460 officers. In 2006, Fort Wayne's crime rate was 5104.1 per 100,000 people, slightly above the national average of 4479.3. There were 18 murders, 404 robberies, and 2,128 burglaries in 2006. Steve Reed was appointed to the position of police chief in 2016. In 2014, former police chief Rusty York was appointed to the position of director of public safety. York previously served as police chief from 2000 to 2014. As of 2010, the Fort Wayne Fire Department includes 375 uniformed firefighters and 18 fire stations. Eric Lahey was appointed fire chief in 2014. Allen County public school districts: FWCS (pink), EACS (yellow), NACS (blue), SACS (green). Fort Wayne Community Schools (FWCS) is the largest public school district in Indiana, enrolling 30,981 students as of the 2013–2014 academic year. FWCS operate 51 facilities, including 31 elementary schools, ten middle schools, and five high schools. The student body is diverse, with 75 spoken languages in the district. East Allen County Schools (EACS) operate 20 schools, with a total enrollment of 9,114. Northwest Allen County Schools (NACS) operate seven elementary schools, two middle schools, and one high school, with a total enrollment of 6,853. Southwest Allen County Schools (SACS) operate six elementary schools, two middle schools, and one high school, with a total enrollment of 6,995. Private primary and secondary education is offered largely through Lutheran Schools of Indiana and the Roman Catholic Diocese of Fort Wayne–South Bend. Amish Parochial Schools of Indiana has schools through eighth grade in rural eastern Allen County. Fort Wayne hosts institutions affiliated with both of Indiana's major state university systems. Indiana University Fort Wayne (IU Fort Wayne) and Purdue University Fort Wayne (PFW) were established in July 2018 after the dissolution of Indiana University – Purdue University Fort Wayne (IPFW), which had enrolled over 13,000 students prior to its closure and was the state's fifth-largest public university. IPFW's degree programs in health sciences are now operated by IU Fort Wayne; as such, that institution is now home to the Fort Wayne Center for Medical Education, a branch of the Indiana University School of Medicine. All remaining IPFW degree programs were taken over by PFW. Ivy Tech Community College of Indiana also contains two campuses in the city. Three private universities are located in the city, including Concordia Theological Seminary, Indiana Institute of Technology, and the University of Saint Francis. Private universities with regional branches in Fort Wayne include Crossroads Bible College, Grace College and Theological Seminary, Huntington University, Indiana Wesleyan University, Manchester University College of Pharmacy, and Trine University. For-profit institutions include Harrison College and International Business College. Composed of 14 branches, the Allen County Public Library is among the 20 largest public libraries in the U.S., and ranks 89th factoring in academic libraries, with 3.4 million volumes. The library's foundation is also among the nation's largest, with $14 million in assets. The entire library system underwent an $84.1 million overhaul from 2002 to 2007. In 2009, over 7.4 million materials were borrowed by patrons, with over 3 million visits made throughout the library system. Major broadcasting network affiliates include WANE-TV (CBS), WPTA-TV (ABC/NBC), WISE-TV (CW), WFFT-TV (Fox), and WFWA-TV (PBS), Northeast Indiana's PBS member station. Religious broadcasters include WINM and W07CL. Access Fort Wayne maintains Fort Wayne and Allen County's Public Access capabilities serving from the Allen County Public Library. Two National Public Radio stations are based in the city, WBNI and WBOI with the new WELT Community Radio Station transmitting from the Allen County Public Library. Fort Wayne is served by two primary newspapers, the Journal Gazette and Pulitzer Prize-winning News-Sentinel. The two dailies have separate editorial departments, but under a joint operating agreement, printing, advertising, and circulation are handled by Fort Wayne Newspapers, Inc. The News-Sentinel announced that it would cease printing operations in favor of digital publishing in August 2017. An A-10 Warthog after completing a training mission at the Fort Wayne Air National Guard Station. Fort Wayne includes two municipal airports, both managed by the Fort Wayne–Allen County Airport Authority. Fort Wayne International Airport (FWA) is the city's primary commercial airport, with five airlines offering direct service to 13 domestic connections. The airport is Indiana's second busiest, with over 350,000 passenger enplanements in 2015. Fort Wayne International is also home to the 122d Fighter Wing's Fort Wayne Air National Guard Station. Smith Field, in northern Fort Wayne, is used primarily for general aviation. Fort Wayne is served by a single Interstate, (Interstate 69), along with an auxiliary beltway (Interstate 469). Once the State Road 37 expressway between Bloomington and Martinsville is completed in 2018, filling a gap in I-69 that exists south of Indianapolis, the road will run south to Evansville; it currently runs north to the Canada–United States border at Port Huron, Michigan. In the coming years, I-69 will extend to the US–Mexico border in Texas, with branches ending in Laredo, Pharr, and Brownsville. Four U.S. Routes bisect the city, including US 24, US 27, US 30, and US 33. Five Indiana State Roads also meet in the city, including State Road 1, State Road 3, State Road 14, State Road 37, and State Road 930. Airport Expressway, a four-lane divided highway, links Fort Wayne International Airport directly to I-69. About 85 percent of residents commute alone by personal vehicle, while another eight percent carpool. Unlike most cities comparable to its size, Fort Wayne does not have an urban freeway system. In 1946, planners proposed a $27 million federally funded freeway, crossing east-west and north-south through downtown. Opponents successfully campaigned against the proposal, objecting to the demolition of nearly 1,500 homes at the time of the post-World War II housing shortage, while playing on fears that the project would force displaced minorities into white neighborhoods. In 1947, Fort Wayne residents voted down the referendum that would have allowed for its construction, dubbed the 'Anthony Wayne Parkway.' Beginning in 1962, construction commenced for I-69 in suburban Fort Wayne. The I-469 beltway around the southern and eastern fringes of Fort Wayne and New Haven was constructed between 1988 and 1995 as the largest public works project in Allen County history, at $207 million. Pennsylvania Railroad Station has stood as a landmark to the city's railroad heritage since 1914. Amtrak's Capitol Limited (Chicago - Toledo - Cleveland - Pittsburgh - Washington, D.C.) and Amtrak's Lake Shore Limited (Chicago - Toledo - Cleveland - Buffalo - Albany - split to Boston and to New York City) are the closest passenger rail services to Fort Wayne, located 25 miles (40 km) north at Waterloo Station. Service by Amtrak ended in 1990 when the Broadway Limited was rerouted away from Fort Wayne's Pennsylvania Station. Until 1961 the Pennsylvania Railroad operated the north-south Northern Arrow through the station. Other stations in Fort Wayne served the passenger trains of the Chicago, Indianapolis, and Louisville Railway ('Manon Railroad') and the Wabash Railroad. There has been a movement to bring direct passenger rail service back in the form of Amtrak or high-speed rail service. In 2013, a feasibility study was published outlining the impacts of a proposed Columbus—Fort Wayne—Chicago high-speed rail corridor. At 300 miles (480 km), the route would cost $1.29 billion and generate some $7.1 billion in economic benefits to the region. Freight service is provided by a class I railroad (Norfolk Southern) and two class III railroads (CSX Transportation). Fort Wayne is headquarters and main operations hub of Norfolk Southern's Triple Crown Services subsidiary, the largest truckload shipper in the U.S.
Fort Wayne's mass transit system is managed by the Fort Wayne Public Transportation Corporation (Citilink), providing 12 bus routes through the cities of Fort Wayne and New Haven via downtown's Central Station. CampusLink debuted in 2009 as a free shuttle service for students, faculty, and general public traveling between Ivy Tech's Coliseum and North campuses, IPFW and its student housing on the Waterfield Campus, and shopping and residential areas. MedLink debuted in 2013 connecting Parkview Regional Medical Center with Parkview Health's Randallia campus. Despite annual ridership of 2.2 million, less than one percent of residents commute by public transportation. Fort Wayne is served by two intercity bus providers: Greyhound Lines (Indianapolis—Toledo—Detroit) and Lakefront Lines (Chicago—Columbus—Akron). In 2016, the city introduced its first bike-sharing program, including five stations and 25 bicycles. Fort Wayne is served by ten medical centers belonging to one of two regional healthcare providers in the city: Parkview Health System and Lutheran Health Network. Notable hospitals include Dupont Hospital, Lutheran Hospital of Indiana, Parkview Regional Medical Center, Parkview Hospital Randallia, and St. Joseph Hospital. Over 1,600 patient beds are available throughout the city's healthcare system. As of 2017[update], both healthcare systems were the city's first and second largest employers, respectively, and contribute to a total healthcare workforce in Allen County of 34,000. VA Northern Indiana Health Care System's Fort Wayne Campus provides medical services through the Department of Veterans Affairs. City Utilities is the largest municipally owned water utility in Indiana, supplying residents with 72 million US gallons (270,000 m3) of water per day via the Three Rivers Water Filtration Plant and St. Joseph River. Sanitary sewer treatment is also managed by City Utilities. The City of Fort Wayne offers full curbside recycling and solid waste collection services for residents, presently contracted through Republic Services. Electricity is provided by Indiana Michigan Power, a subsidiary of American Electric Power, while natural gas is supplied by Northern Indiana Public Service Company (NIPSCO), a subsidiary of NiSource. All tier 1 networks and several additional telecommunication service providers cover the Fort Wayne rate area. ^ According to J. Dunn, Jr., this name was "usually said to mean "blackberry patch," or "blackberry bush," this plant being considered an emblem of antiquity because it sprang up on the sites of old villages. This theory rests on the testimony of Barron, a longtime French trader on the Wabash. It is more probable that Kekionga is a corruption or dialect form of Kiskakon, or Kikakon, which was the original name of the place." J. P. Dunn. But, Michael McCafferty, an Algonquian and Uto-Aztecan linguist professor at Indiana University, exhaustively examined the etymology of 'Kekionga' and dismissed Dunn's explanation and several others. See the chapter "Trails to Kekionga" in the relevantly titled Native American Place Names of Indiana (Urbana and Chicago: University of Illinois Press, 2008), esp. p. 76. In the 1680s, French traders established a post near Kekionga due to its location on a portage between the Great Lakes and Mississippi River. ^ "Fort Wayne History". Retrieved April 27, 2015. ^ Salter Rodriguez, Rosa (June 22, 2007). "Census stats can't back up old moniker". The Journal Gazette. ^ Olson, Eric (February 29, 2012). "30th anniversary of the Great Flood of 1982: Where were you?". WPTA-TV. Archived from the original on June 28, 2014. Retrieved July 19, 2013. ^ Crothers, Julie (August 16, 2013). "Righting a toppled icon". fortwayne.com. Archived from the original on May 18, 2015. Retrieved April 27, 2015. ^ "Phelps Dodge Magnet Wire to consolidate operations to Fort Wayne". Inside Indiana Business. February 16, 2004. Archived from the original on June 28, 2014. Retrieved July 18, 2013. ^ "2016 U.S. Gazetteer Files". United States Census Bureau. Retrieved July 28, 2017. ^ a b "American FactFinder". U.S. Census Bureau. Retrieved December 11, 2012. ^ Cite error: The named reference USCensusEst2017 was invoked but never defined (see the help page). ^ "US Board on Geographic Names". U.S. Geological Survey. October 25, 2007. Retrieved January 31, 2008. ^ "Fort Wayne, IN to S State Line Rd & State Road 14, Woodburn, 46797 – Google Maps". Google. Retrieved August 15, 2010. ^ "Fort Wayne, IN to Windy Shore Dr, Coldwater, MI 49036 – Google Maps". Google. Retrieved August 15, 2010. ^ a b "Metropolitan and Micropolitan Statistical Areas". U.S. Census Bureau. July 1, 2011. Archived from the original on October 20, 2013. Retrieved October 19, 2013. ^ Brice, Wallace A. (1868) History of Fort Wayne, from the Earliest Known Accounts of this Point to the Present Period. D.W. Jones & Son. ^ a b c "Fort Wayne History". City of Fort Wayne. Retrieved September 5, 2008. ^ a b c d "Annual Labor Force". Greater Fort Wayne Inc. 2014. Archived from the original on May 11, 2016. Retrieved May 12, 2016. ^ a b "Communications & Defense". Fort Wayne–Allen County Economic Development Alliance. 2012. Archived from the original on December 23, 2014. Retrieved April 27, 2015. ^ Lanka, Benjamin (June 20, 2009). "City reaches summit: 3rd All-America title". The Journal Gazette. Archived from the original on July 11, 2011. Retrieved June 20, 2009. ^ "The U.S. Conference of Mayors/Waste Management 1999 City Livability Awards Program". U.S. Conference of Mayors. 1999. Archived from the original on April 8, 2014. Retrieved April 8, 2014. ^ INDIANA: A REDEMPTION FROM SLAVERY New York: Houghton Mifflin and Company, 1888, 48, Note 1. ^ Goodrich, De Witt C. and Charles Richard Tuttle (1875) An Illustrated History of the State of Indiana. (NP:R. S. Peale & Co., ND). ^ "Vincennes, Sieur de (Jean Baptiste Bissot)," The Encyclopedia Americana (Danbury, CT: Grolier, 1990), 28:130. ^ a b c Peckham, Howard Henry (2003) "Indiana: A History". W.W. Norton ISBN 0-252-07146-8. ^ Hoxie, Frederick E. (1996). Encyclopedia of North American Indians: Native American History, Culture, and Life from Paleo-Indians to the Present. Boston, Massachusetts: Houghton Mifflin Company. p. 343. ISBN 0-395-66921-9. ^ Poinsatte, Charles R. (1969). Fort Wayne During the Canal Era 1828–1855. Indianapolis, Indiana: Indiana Historic Bureau. pp. 2–4. ^ "The Landing". Architecture & Community Heritage · Fort Wayne, Indiana. Retrieved July 4, 2017. ^ Beatty, John D. (2006). History of Fort Wayne & Allen County. Evansville, Indiana: M.T. Publishing Company, Inc. p. 28. ISBN 1-932439-44-7. ^ Fort Wayne: History: County Seat Becomes Industrial Center. Retrieved on May 4, 2008. ^ Stover, John F. (1982). Transportation and the Early Nation. Indianapolis, Indiana: Indianapolis Historic Society. pp. 141–142. ^ Beatty 2006, p. 73. ^ Beatty 2006, p. 350–355. ^ USDOJ: US Attorney's Office - Northern District of Indiana. Retrieved on May 15, 2013. ^ Jarosh, Andrew. "Heroism, tragedy color story of Fort Wayne's worst flood in 1913". The News-Sentinel. Retrieved December 29, 2012. ^ Beatty 2006, p. 192. ^ Beatty 2006, p. 198, 202. ^ Haas Zuber, Connie (November 30, 2010). "Lincoln Tower rises above its times". Fort Wayne Monthly. Archived from the original on February 2, 2014. Retrieved December 29, 2012. ^ Beatty 2006, p. 107. ^ Beatty 2006, p. 107, 109. ^ Beatty 2006, p. 117, 119. ^ a b Beatty 2006, p. 119. ^ Beatty 2006, p. 136. ^ Beatty 2006, p. 132. ^ Leininger, Kevin (1982). "The Fort Wayne flood of 1982". The News-Sentinel. Retrieved November 4, 2013. ^ "Inflation Calculator". US Inflation Calculator. US Inflation Calculator. Retrieved May 19, 2015. ^ "Economy at a Glance". Bureau of Labor Statistics. United States Department of Labor. Retrieved May 2, 2015. ^ Beatty 2006, p. 138–142. ^ Beatty 2006, p. 418. ^ Leininger, Kevin (December 16, 2008). "Could nonprofit revitalize downtown?". The News-Sentinel. Archived from the original on February 13, 2009. Retrieved January 8, 2009. ^ Lanka, Benjamin (January 4, 2009). "Delays encircle Harrison Square". The Journal Gazette. Archived from the original on June 10, 2015. Retrieved January 8, 2009. ^ Smith, Ashley (October 1, 2008). "Dirt turned on $536M Parkview Regional Medical Center". The News-Sentinel. Archived from the original on February 21, 2014. Retrieved December 29, 2012. ^ "G001 - Geographic Identifiers - 2010 Census Summary File 1". United States Census Bureau. Retrieved July 28, 2015. ^ a b Hill, Christopher (2006). Geological Framework and Glaciation of the Eastern Area. Boise State University. ^ a b "Assessing and Addressing Indiana Urban Tree Canopy" (PDF). Indiana Department of Natural Resources. October 2011. Retrieved June 14, 2013. ^ "Tree Cover % – How Does Your City Measure Up?". Deeproot.com. April 25, 2010. Retrieved June 14, 2013. ^ "Awards & Accomplishments". Fort Wayne Parks and Recreation. Retrieved June 14, 2013. ^ "Neighborhood Quadrant Map" (PDF). City of Fort Wayne. Retrieved July 29, 2013. ^ "Fort Wayne Parks and Boulevard System" (PDF). City of Fort Wayne. Retrieved May 10, 2014. ^ "Parks, boulevard system now on National Historic Register". City of Fort Wayne. Retrieved May 10, 2014. ^ a b c d "Architectural Styles" (PDF). City of Fort Wayne. Retrieved July 29, 2013. ^ "Williams Woodland Park Historic District". City of Fort Wayne. Archived from the original on December 16, 2014. Retrieved July 29, 2013. ^ Larson, Cindy (May 14, 2011). "Live inside a work of art". The News-Sentinel. Archived from the original on March 13, 2014. Retrieved July 29, 2013. ^ "Arts United Center". Retrieved July 29, 2013. ^ "One Summit Square". Emporis.com. Retrieved July 29, 2013. ^ Kottek, Marcus; Greiser, Jürgen; et al. (June 2006). "World Map of Köppen–Geiger Climate Classification". Meteorologische Zeitschrift. E. Schweizerbart'sche Verlagsbuchhandlung. 15 (3): 261. doi:10.1127/0941-2948/2006/0130. 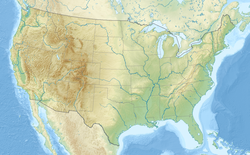 ^ "USDA Plant Hardiness Zone Map". United States Department of Agriculture. Retrieved July 22, 2014. ^ Fort Wayne, Indiana Climate – Heat / Cold – NWS Northern Indiana. Retrieved on April 30, 2008. ^ Gong, Dave (July 1, 2015). "Outages linger; storm rivals '12 derecho". The Journal Gazette. Retrieved July 14, 2015. ^ Sade, Vivian (February 1, 2014). "January's endless snow, bitter cold set records". The Journal Gazette. Archived from the original on February 22, 2014. Retrieved February 6, 2014. ^ Fort Wayne, Indiana Climate – Winter Weather – NWS Northern Indiana. Retrieved on April 30, 2008. ^ "Fort Wayne, Indiana Climate–Tornadoes". NWS Northern Indiana. Retrieved April 30, 2008. ^ NOAA – A Summary of the May 26, 2001 Tornado Event Over Northern Indiana and Extreme Northwest Ohio. Retrieved on April 25, 2008. ^ "Saturday marks one year anniversary of June 29 storm". WANE-TV. June 29, 2013. Archived from the original on August 3, 2013. Retrieved July 2, 2013. ^ (2013-01-01). Year in review: Top Fort Wayne news stories Archived October 29, 2013, at the Wayback Machine. The News-Sentinel. Retrieved on May 8, 2013. ^ "NowData - NOAA Online Weather Data". National Oceanic and Atmospheric Administration. Retrieved October 10, 2018. ^ "IN FT Wayne INTL AP". National Oceanic and Atmospheric Administration. Retrieved October 10, 2018. ^ "WMO Climate Normals for Fort Wayne/Municipal, IN 1961–1990". National Oceanic and Atmospheric Administration. Retrieved June 6, 2015. ^ United States Census Bureau. "Census of Population and Housing". Archived from the original on May 12, 2015. Retrieved April 28, 2015. ^ "American Factfinder". census.gov. Archived from the original on February 12, 2011. Retrieved August 27, 2011. ^ "Fort Wayne (city), Indiana". State & County QuickFacts. U.S. Census Bureau. Archived from the original on August 3, 2012. ^ "Indiana - Race and Hispanic Origin for Selected Cities and Other Places: Earliest Census to 1990". U.S. Census Bureau. Archived from the original on August 6, 2012. ^ Leininger, Kevin (March 13, 2010). "Assimilation crucial for Fort Wayne's Burmese". The News-Sentinel. Archived from the original on July 11, 2011. Retrieved March 13, 2010. ^ Keen, Judy (February 21, 2011). "Burmese try to adapt to America's bigger 'village'". USA Today. Retrieved December 16, 2014. ^ Salter Rodriguez, Rosa (June 22, 2007). "'City of Churches' hard to prove: Census stats can't back up old moniker". The Journal Gazette. ^ a b "Fort Wayne Facts". City of Fort Wayne. Retrieved December 30, 2012. ^ "Religion in Fort Wayne, Indiana". Sperling's Best Places. Retrieved November 8, 2013. ^ Linsenmayer, Steve (September 24, 2007). "Monks here support boycott". The News-Sentinel. Archived from the original on December 16, 2008. Retrieved September 24, 2008. ^ Congregation Achduth Vesholom Retrieved on August 29, 2012. ^ Bogue, Ellie (September 10, 2013). "Burmese Muslims building new mosque in Fort Wayne". The News-Sentinel. Archived from the original on September 27, 2013. Retrieved September 23, 2013. ^ Wyche, Paul (March 29, 2015). "Future unsure for GE's crowded campus". The Journal Gazette. Retrieved January 16, 2016. ^ Leininger, Kevin (June 17, 2018). "FOCUS 2018: Even in a robust Fort Wayne economy, some segments are growing faster than others". The News-Sentinel. Retrieved December 23, 2018. ^ a b Beatty, John D. (2006). History of Fort Wayne & Allen County. Evansville, Indiana: M.T. Publishing Company, Inc. p. 89. ISBN 1-932439-44-7. ^ "Falstaff Brewery closing in Ft. Wayne". Chicago Tribune. November 9, 1989. Retrieved December 24, 2013. ^ WPA Writers' Program, Indiana, a Guide to the Hoosier State (1941) p. 195. ^ Beatty, John D. (2006). History of Fort Wayne & Allen County. Evansville, Indiana: M.T. Publishing Company, Inc. pp. 352–353. ISBN 1-932439-44-7. ^ Beatty, John D. (2006). History of Fort Wayne & Allen County. Evansville, Indiana: M.T. Publishing Company, Inc. p. 116. ISBN 1-932439-44-7. ^ Leininger, Kevin (May 6, 2014). "GE looking to demolish some of old Broadway campus". The News-Sentinel. Archived from the original on June 28, 2014. Retrieved May 11, 2014. ^ Beatty, John D. (2006). History of Fort Wayne & Allen County. Evansville, Indiana: M.T. Publishing Company, Inc. p. 134. ISBN 1-932439-44-7. ^ Beatty, John D. (2006). History of Fort Wayne & Allen County. Evansville, Indiana: M.T. Publishing Company, Inc. p. 135. ISBN 1-932439-44-7. ^ "Major Employers: Top Employers in Fort Wayne and Allen County". Greater Fort Wayne Inc. 2017. Retrieved July 11, 2017. ^ Goldsborough, Jaclyn (February 5, 2015). "Tourism in Fort Wayne, Allen County increases". The News-Sentinel. Archived from the original on February 8, 2015. Retrieved February 7, 2015. ^ "America's Shrinking Middle Class: A Close Look at Changes Within Metropolitan Areas". Pew Research Center. 2016. Retrieved May 12, 2016. ^ "Allen County, Indiana". STATS Indiana. 2017. Retrieved May 29, 2017. ^ Wyche, Paul (July 1, 2013). "Frontier reorganizes region, with Fort Wayne HQ". The Journal Gazette. Archived from the original on May 18, 2015. Retrieved August 4, 2013. ^ "Steel Dynamics – Fortune 500". Fortune. 2008. Retrieved April 8, 2014. ^ Cole, Ryan (February 24, 2010). "Lincoln brought to life". The Wall Street Journal. Retrieved May 10, 2015. ^ "Major Employers". Greater Fort Wayne Inc. 2015. Retrieved May 10, 2015. ^ "About Us". The Embassy Theatre. Retrieved May 15, 2008. ^ "The History of the Phil". Fort Wayne Philharmonic Orchestra. Archived from the original on October 17, 2013. Retrieved July 2, 2013. ^ "USF Performing Arts Center Full History". University of Saint Francis. Archived from the original on June 27, 2012. Retrieved December 27, 2012. 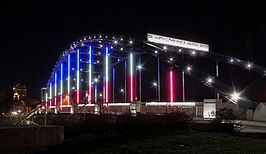 ^ "Fort Wayne Cultural District". Arts United of Greater Fort Wayne. Archived from the original on May 30, 2013. Retrieved August 8, 2012. ^ "FAME's Impact". The Foundation for Art and Music Education. Archived from the original on June 15, 2013. Retrieved July 2, 2013. ^ "About Foellinger Theatre". Fort Wayne Parks and Recreation. Retrieved December 29, 2012. ^ "About Us". Arena Dinner Theatre. Retrieved October 13, 2013. ^ Cicero, Karen (April 4, 2009). "10 Best Zoos for Kids: 5. Fort Wayne Children's Zoo". Parents magazine. Retrieved December 16, 2014. ^ "Zoo named one of country's best". WANE-TV NewsChannel 15. July 7, 2015. Retrieved July 20, 2015. ^ "2013 attendance second-highest ever". Fort Wayne Children's Zoo. Retrieved December 16, 2014. ^ "Fort Wayne Children's Zoo to hold job fair March 9". The News-Sentinel. February 26, 2013. Archived from the original on November 2, 2013. Retrieved March 14, 2013. ^ "About the Conservatory". Fort Wayne Parks and Recreation. Retrieved December 16, 2014. ^ "Fact Sheet 2013". Science Central. Retrieved April 28, 2015. ^ "About the Museum". Fort Wayne Museum of Art. Retrieved September 24, 2013. ^ Krieg, Sheryl (June 6, 2013). "Artlink, Fort Wayne Museum of Art thrive after move downtown". The News-Sentinel. Archived from the original on December 19, 2014. Retrieved June 6, 2013. ^ "Collections". Allen County–Fort Wayne Historical Society. Retrieved August 10, 2010. ^ "Home". Historic Fort Wayne, Inc. Archived from the original on September 24, 2013. Retrieved September 24, 2013. ^ "History of the Museum". African/African–American Historical Museum. Archived from the original on January 4, 2011. Retrieved August 10, 2010. ^ "Home". Fort Wayne Firefighters Museum. Retrieved August 10, 2010. ^ "Aviation Museum". Fort Wayne–Allen County Airport Authority. Retrieved January 20, 2014. ^ West, Nick (October 9, 2009). "Genealogy gathering; 420 expected for conference, library's largest yet". The News-Sentinel. Archived from the original on October 2, 2011. Retrieved August 9, 2010. ^ "The Genealogy Center" (PDF). Allen County Public Library. Retrieved December 27, 2012. ^ "History". Germanfest. Retrieved August 10, 2010. ^ "Culture & Entertainment". JapanInFortWayne.com. Archived from the original on September 10, 2013. Retrieved July 1, 2013. ^ "About us". Fort Wayne Pride. Retrieved December 16, 2014. ^ "About". BBQ RibFest. Retrieved August 30, 2012. ^ Lanka, Benjamin (September 24, 2011). "More than 9,000 participate in Fort4Fitness". The Journal Gazette. Archived from the original on April 22, 2012. Retrieved November 9, 2011. ^ "Inaugural F4F Spring Cycle a huge success!" (PDF). Fort4Fitness, Inc. Archived from the original (PDF) on July 12, 2014. Retrieved August 10, 2010. ^ Swanson, Andrew (November 27, 2008). "Lights wow crowds". The News-Sentinel. Archived from the original on September 25, 2009. Retrieved August 10, 2010. ^ "Johnny Appelseed Park". City of Fort Wayne, Indiana. Retrieved May 16, 2015. ^ Todd, Deb (September 16, 2009). "Fall's favorite festival: Johnny Appleseed weekend has been an area fixture for 35 years". The News-Sentinel. Archived from the original on June 29, 2014. Retrieved August 30, 2012. ^ Organ, Aaron (July 22, 2010). "TRF chief happy with this year's numbers". The News-Sentinel. Archived from the original on March 11, 2012. Retrieved August 10, 2010. ^ "Allen County Fair". Visit Fort Wayne. Retrieved December 21, 2014. ^ "About". National Soccer Festival. Retrieved January 20, 2014. ^ WANE Staff Reports (August 10, 2014). "Thousands coming to Fort Wayne for soccer festival". Archived from the original on August 2, 2015. Retrieved May 5, 2015. ^ Goldsborough, Jaclyn (April 9, 2014). "Vera Bradley sale is about more than just purses; economic impact on Fort Wayne economy sizable". The News-Sentinel. Archived from the original on December 17, 2014. Retrieved December 16, 2014. ^ "Purdue Fort Wayne Branding Released" (Press release). Purdue University Fort Wayne. June 18, 2018. Retrieved June 21, 2018. ^ Miklich, Eric, Night Baseball in the 19th century. Retrieved on May 16, 2008. ^ a b (2008-01-19). Fort Wayne Sports Moments Archived May 18, 2015, at the Wayback Machine. The News-Sentinel. Retrieved on June 11, 2009. ^ Sebring, Blake (May 17, 2013). "Carl Bennett built part of Fort Wayne history Fort Wayne Sports History: Time to vote for the all-time best". The News-Sentinel. Archived from the original on October 29, 2013. Retrieved May 17, 2013. ^ Rushin, Steve, (February 5, 2007). Storming The Fort (wayne). Sports Illustrated. Retrieved on May 16, 2008. ^ "NBA.com: This Date In The NBA: March". Retrieved May 5, 2015. ^ "By the numbers". Fort Wayne Monthly's City Guide 2014. Fort Wayne Newspapers, Inc. 13: 10. 2014. ^ "Franke Park" (PDF). Fort Wayne Parks and Recreation Department. Retrieved December 19, 2014. ^ "The Fort Wayne Community". Visit Fort Wayne. Retrieved August 10, 2014. ^ Todd, Deb (May 29, 2013). "Take a hike (or bike ride) Saturday on National Trails Day". The News-Sentinel. Archived from the original on November 1, 2013. Retrieved May 29, 2013. ^ Beatty, John D. (2006). History of Fort Wayne & Allen County. Evansville, Indiana: M.T. Publishing Company, Inc. pp. 122–23. ISBN 1-932439-44-7. ^ "Verbatim: Rivergreenway earns national designation". The Journal Gazette. May 28, 2009. Retrieved June 9, 2009. ^ LeBlanc, Matthew (March 16, 2018). "Ground broken on segment of trail". The Journal Gazette. Retrieved March 16, 2018. ^ Wiehe, Jeff (April 28, 2015). "Mayor unveils plans for 3 bicycle lanes". The Journal Gazette. Retrieved April 28, 2015. ^ "Pedal plan, paths win prestigious award". City of Fort Wayne. Retrieved March 14, 2013. ^ "BFC Spring 2016 Report Card Fort Wayne, IN" (PDF). 2016 Bicycle Friendly Communities. League of American Bicyclists. Retrieved June 17, 2018. ^ "Fort Wayne, IN" (PDF). 2017 ParkScore Index. Trust for Public Land. Archived from the original (PDF) on March 16, 2018. Retrieved March 16, 2018. ^ a b "City Council". City of Fort Wayne. Retrieved June 26, 2010. ^ Dave, Gong (November 4, 2015). "Henry wins 3rd straight term". The Journal Gazette. Retrieved January 10, 2016. ^ Leininger, Kevin (October 8, 2013). "Henry taps Karl Bandemer as Fort Wayne's new deputy mayor". The News-Sentinel. Archived from the original on June 29, 2014. Retrieved October 8, 2013. ^ Gong, Dave (November 4, 2015). "Keesling's win ends Davis' bid for clerk". The Journal Gazette. Retrieved January 10, 2015. ^ "Indiana Code 36-3-1". State of Indiana. Retrieved March 31, 2007. ^ "Senate Bill No. 225". State of Indiana. Retrieved March 31, 2007. ^ "About the Fort Wayne Police Department". Fort Wayne Police Department. Archived from the original on September 13, 2010. Retrieved June 26, 2010. ^ a b "Fort Wayne IN Crime Statistics (2006 Crime Data)". AreaConnect Fort Wayne. Retrieved June 26, 2010. ^ Gong, Dave (August 1, 2016). "Reed sworn in as Fort Wayne police chief". The Journal Gazette. Retrieved October 14, 2018. ^ Bogue, Ellie (January 2, 2014). "New Fort Wayne police chief and director of public safey sworn in". The News-Sentinel. Archived from the original on January 3, 2014. ^ "Fort Wayne Fire Department Annual Report 2010" (PDF). Fort Wayne Fire Department. Retrieved May 15, 2013. ^ Meyers, Chris (May 28, 2014). "Firefighter to follow Biggs as new chief". The Journal Gazette. Archived from the original on May 31, 2014. ^ "Fort Wayne, Indiana Registered Voters - Overview Statistics and Quick Facts". CensusViewer.com. Retrieved December 17, 2014. ^ "FWCS Becomes Largest School System in Indiana". 21Alive. Archived from the original on September 23, 2012. ^ "District Profile" (PDF). Fort Wayne Community Schools. Archived from the original (PDF) on May 27, 2014. Retrieved May 9, 2014. ^ "East Allen County Schools". Indiana Department of Education. Retrieved May 9, 2014. ^ "2013 Reports" (PDF). Northwest Allen County Schools. Archived from the original (PDF) on October 24, 2014. Retrieved May 9, 2014. ^ "Our Schools". Southwest Allen County Schools. Archived from the original on May 12, 2014. Retrieved May 9, 2014. ^ "MSD Southwest Allen County Schools". Indiana Department of Education. Retrieved May 9, 2014. ^ The Amish Schools of Indiana: Faith in Education, by Stephen Bowers; p. 40 Harroff. Retrieved on July 25, 2009. ^ "IPFW: By the Numbers" (PDF). IPFW. Retrieved May 6, 2014. ^ Wright, Darrin (June 16, 2017). "Indiana, Purdue trustees officially finalize IPFW split". Fort Wayne, IN: WOWO. Retrieved January 22, 2018. ^ "The Nation's Largest Libraries: A Listing By Volumes Held". American Library Association. Retrieved May 10, 2014. ^ "After 28 years' leadership, Allen County Public Library director will retire". The News-Sentinel. February 27, 2014. Archived from the original on June 28, 2014. Retrieved May 10, 2014. ^ Checca, Carey (November 27, 2001). "Library petition counts due today". The Journal Gazette. ^ "The Pulitzer Prizes | Awards". www.pulitzer.org. Retrieved May 5, 2015. ^ "Passenger Boarding (Enplanement) and All-Cargo Data for U.S. Airports". Federal Aviation Administration. Retrieved March 29, 2017. ^ "Home of the Blacksnakes". 122nd Fighter Wing. Archived from the original on June 27, 2010. Retrieved June 27, 2010. ^ "Airport History". Smith Field Airport. Retrieved December 27, 2012. ^ "Commissioners OK extra money for road extension". The Journal Gazette. July 7, 2000. ^ a b "American FactFinder". U.S. Census Bureau. Archived from the original on August 15, 2014. Retrieved August 23, 2014. ^ Beatty 2006, p. 190. ^ Beatty 2006, p. 108. ^ Leininger, Kevin (December 3, 2011). "Fort Wayne: Fat, stupid... and melancholy?". The News-Sentinel. Archived from the original on December 7, 2011. Retrieved February 5, 2013. ^ a b Lanka, Benjamin (May 1, 2015). "Bypassing the bypass". The Journal Gazette. Retrieved August 8, 2012. ^ Beatty 2006, p. 117. ^ Caylor, Bob (April 4, 2009). "Rally for Fort Wayne train service draws hundreds". The News-Sentinel. Archived from the original on April 18, 2009. Retrieved November 22, 2009. ^ "Northern Indiana/Ohio Passenger Rail Corridor Feasibility Study and Business Plan Executive Summary" (PDF) (Press release). Transportation Economic and Management Systems, Inc. January 2013. Archived from the original (PDF) on December 18, 2014. Retrieved May 31, 2014. ^ a b "Rail System". Greater Fort Wayne, Inc. Archived from the original on December 12, 2013. Retrieved December 8, 2013. ^ "Citilink service routes map" (PDF). Fort Wayne Public Transportation Corporation. Retrieved February 6, 2009. ^ a b Leininger, Kevin (April 25, 2009). "Free bus service to link 2 campuses to dorms, city". The News-Sentinel. Archived from the original on July 11, 2011. Retrieved April 25, 2009. ^ Sade, Vivian (December 15, 2012). "Parkview subsidy helps transit system add Medlink". The Journal Gazette. Archived from the original on July 22, 2015. Retrieved December 3, 2013. ^ "Lakefront Lines Scheduled Intercity Bus Service". Archived from the original on July 22, 2015. Retrieved July 29, 2013. ^ Gong, Dave (April 15, 2016). "Fort Wayne announces bike-share program". The Journal Gazette. Retrieved April 17, 2016. ^ a b "Healthcare". Greater Fort Wayne Inc. Retrieved July 11, 2017. ^ "Fort Wayne Campus". U.S. Department of Veterans Affairs. Retrieved July 25, 2013. ^ "Three Rivers Filtration Plant" (PDF). City of Fort Wayne. Retrieved December 27, 2012. ^ "2016 Community Profile" (PDF). Greater Fort Wayne Inc. Archived from the original (PDF) on June 23, 2017. Retrieved July 11, 2017. ^ "About FWSCI". Fort Wayne Sister Cities International, Inc. Retrieved July 29, 2013. ^ Bogue, Ellie (February 12, 2015). "Fort Wayne has new "friendship" city in Myanmar". The News-Sentinel. Archived from the original on February 12, 2015. Retrieved February 12, 2015. Beatty, John D. (2006). History of Fort Wayne & Allen County, Indiana, 1700–2005. M.T. Publishing Company. ISBN 1-932439-44-7. Bushnell, Scott M. (2007). Historic Photos of Fort Wayne. Turner Publishing Company. ISBN 978-1-59652-377-7. Griswold, Bert J. (1973). Fort Wayne, Gateway of the West. AMS Press. ISBN 0-404-07133-3. Hawfield, Michael C. (1988). Fort Wayne Cityscapes: Highlights of a Community's History. Windsor Publications. ISBN 0-89781-244-1. Miller, Dodie Marie (2000). African-Americans in Fort Wayne: The First 200 Years. Arcadia Publishing. ISBN 0-7385-0715-6. Paddock, Geoff (2002). Headwaters Park: Fort Wayne's Lasting Legacy. Arcadia Publishing. ISBN 0-7385-1971-5. Violette, Ralph (1999). Fort Wayne, Indiana. Arcadia Publishing. ISBN 0-7524-1309-0. Wikimedia Commons has media related to Fort Wayne, Indiana. Wikisource has the text of the 1879 American Cyclopædia article Fort Wayne. Wikivoyage has a travel guide for Fort Wayne. This page was last edited on 17 April 2019, at 19:05 (UTC).